As soon as I arrived at the Staatsbibliothek I knew there was something different about this particular library. There was a security checkpoint, a large glass barrier, lockers, a coat check and a beautifully designed building. Hmmm…you know you’re in Germany! The cost of entering this highly protected chamber of books – 25 Euros per year or 10 Euros per month – no discounts or reductions. It turned out that there were a couple of architects who were just about to go on a tour of the building so I joined in – at least that way, I could take a look at what I would be paying for. 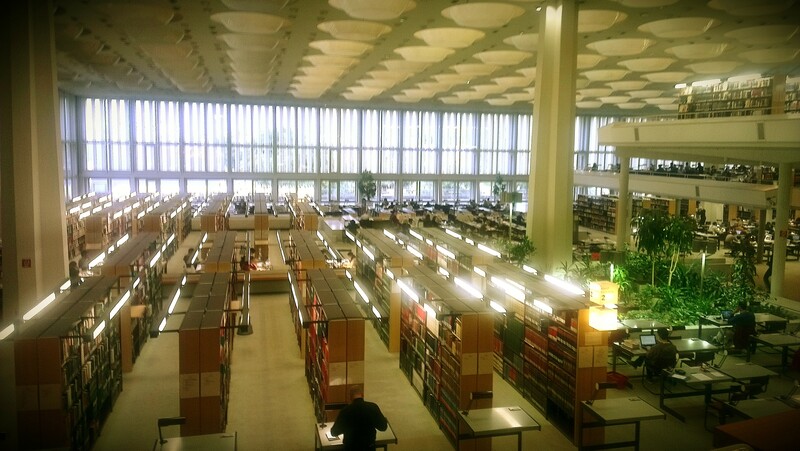 The library was designed by Hans Scharoun and Edgar Wisniewski (thanks to the architects on the tour). It’s an incredibly open building with few doors or closed spaces, but many levels and a lot of natural light. In the photo before the jump, those circles in the main room on the ceiling are actually skylights all along the ceiling to let in as much natural light as possible. Then the librarian showed us the coolest thing – one of Beethoven’s original symphonies and an excerpt from one of Goethe’s original texts – stored in a glass cabinet in the library. HOLY CRAP. I was sold right then. I bought my yearly membership for 25 Euros. I got my library card, the standard information pamphlets and a clear plastic bag and that was it. I had no idea what to do next. I saw there were lockers and a coat rack but had no idea as to what exactly I was allowed to bring in and what I was supposed to do with the clear plastic bag? Ugh – the annoying things about being in a different country! Putting on a nice smile and a sympathetic face, I asked the friendly Berliner library worker standing behind the coat rack in my best German – “Uhhm excuse me what are the lockers for?” – of course, I used the wrong word for lockers and the Berliner’s face turned to stone and just stared at me stating “Schliessfach!” – “okay thanks, now I know the word for “locker” in German – uhm how do I used them?”. Another angry stare and then, “EIN Euro!”. The Canadian in me can’t let up, “okay, thanks so much for your help. I really appreciate it! Have a great day!” And I just got a cold angry stare in return….oh well, that’s a Berliner for you! ha ha love that the plastic bags are the only sound!